Two companion papers published today in the Journal of Climate find the natural ocean oscillations the Pacific Decadal Oscillation (PDO) and Atlantic Multidecadal Oscillation (AMO) have had significant and "important influence" upon intra- to multi-decadal [shorter and longer than 1 decade] US climate variability including temperature and precipitation since 1896. "PDO phase seems to be an important influence on spring temperatures in the northwest U.S., eastern temperature regimes in annual, winter, summer and fall temperatures are more coincident with cool and warm phase AMO regimes. Annual AMO values also correlate significantly with summer temperatures along the eastern seaboard and fall temperatures in the southwest. Given evidence of the abrupt onset of cold winter temperatures in the eastern U.S. during 1957-1958, possible climate mechanisms associated with the cause and duration of the eastern U.S. warming hole [and the ice age scare of the 1970's] period - identified here as a cool temperature regime occurring between the late 1950’s and late 1980’s..."
"...annual precipitation are in approximate anti-phase with the PDO." 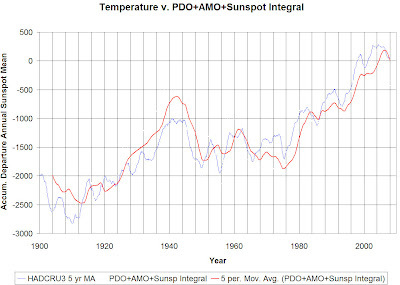 Indeed, a very simple climate model based solely upon the sunspot integral + PDO + AMO explains 96% of global climate change over the past 110 years. Think of the billions that could have been saved from the failed numerical models. The Optimal Ranking Regime (ORR) method was used to identify intra- to multi-decadal (IMD) time windows containing significant ranking sequences in U.S. climate division temperature data. The simplicity of the ORR procedure’s output – a time series’ most significant non-overlapping periods of high or low rankings – makes it possible to graphically identify common temporal breakpoints and spatial patterns of IMD variability in the analyses of 102 climate division temperature series. This approach is also applied to annual AMO and PDO climate indices, a northern hemisphere annual temperature (NHT) series, and divisional annual and seasonal temperature data during 1896-2012. In addition, Pearson correlations are calculated between PDO, AMO, and NHT series and the divisional temperature series. Although PDO phase seems to be an important influence on spring temperatures in the northwest U.S., eastern temperature regimes in annual, winter, summer and fall temperatures are more coincident with cool and warm phase AMO regimes. Annual AMO values also correlate significantly with summer temperatures along the eastern seaboard and fall temperatures in the southwest. Given evidence of the abrupt onset of cold winter temperatures in the eastern U.S. during 1957-1958, possible climate mechanisms associated with the cause and duration of the eastern U.S. warming hole period - identified here as a cool temperature regime occurring between the late 1950’s and late 1980’s – are discussed. In a preceding companion paper, the Optimal Ranking Regime (ORR) method was used to identify intra- to multi-decadal (IMD) regimes in U.S. climate division temperature data during 1896-2012. Here, the method is used to test for annual and seasonal precipitation regimes during that same period. Water year mean streamflow rankings at 125 U.S. Hydro-Climatic Data Network gauge stations are also evaluated during 1939-2011. The precipitation and streamflow regimes identified are compared with ORR-derived regimes in the Pacific Decadal Oscillation (PDO), the Atlantic Multidecadal Oscillation (AMO), and indices derived from gridded SSTA analysis data. Using a graphic display approach that allows for the comparison of IMD climate regimes in multiple time series, an inter-decadal cycle in western precipitation is apparent after 1980, as is a similar cycle in northwestern streamflow. Before 1980, IMD regimes in northwestern streamflow and annual precipitation are in approximate anti-phase with the PDO. One of the clearest IMD climate signals found in this analysis are post-1970 wet regimes in eastern U.S streamflow and annual precipitation, and also in fall (SON) precipitation. Pearson correlations between time series of annual and seasonal precipitation averaged over the eastern U.S. and sea surface temperature anomaly (SSTA) analysis data show relatively extensive positive correlations between warming tropical SSTA and increasing fall precipitation. The possible Pacific and northern Atlantic roots of the recent eastern U.S. wet regime, and the general characteristics of U.S. climate variability in recent decades that emerge from this analysis and that of the companion paper, are discussed. I saw this same graph in a book ~30 years ago. I think this knowledge has been around for a long time but is selectively ignored by those who profit by doing so.